TNPSC Group 2A Exam Counselling starts on 29-12-2014 . Dear friends, if you are lost your chance in this year 2014 Group 2A , don't worry, soon there will be announcement for Group 2A 2015 Exam. So start your preparation for that now itself. All the best ! 12-12-2014 : TNPSC Group 2A Non Interview Posts Exam 2014 Result is published now. 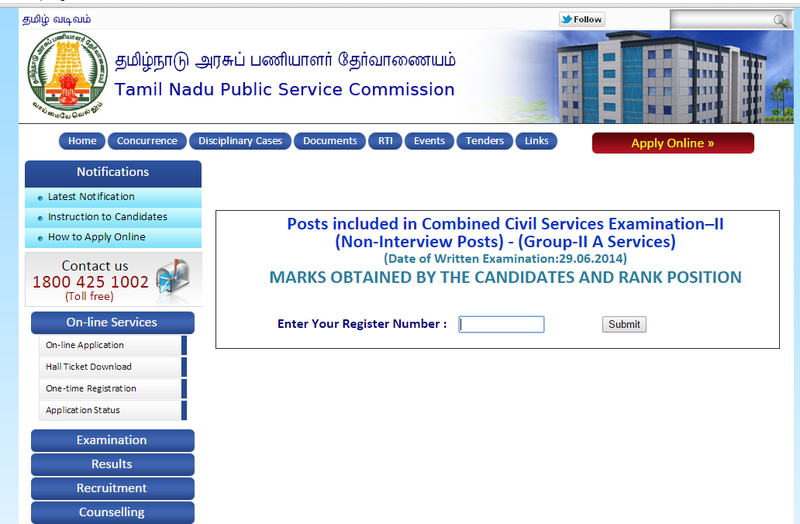 Check your result with your communal rank and over all rank from the TNPSC Website. TNPSC Group 2A Exam 2014 Results with in 15th December - latest news. 02-12-2014 : On 08-11-2014, TNPSC Chairman informed that the TNPSC VAO Exam 2014 results will be published with in three or four week. So it is expected that the TNPSC VAO Exam will be published in the month of December 2014 and following that, all other exam results including TNPSC Group 2A and TNPSC Group 1 Preliminary Exams Result also may be published. So we can expect the result of TNPSC Group 2A in the second or third week of December 2014. 14-10-2014 : TNPSC has published the official announcement of the most expected TNPSC Group 4 Exam 2014 Notification (Exam date 21-12-2014) for filling up 4963 posts. Next important announcement from the TNPSC may be results of both TNPSC VAO Exam 2014 and Group 2A Exam 2014. If you are not confident in the TNPSC VAO Exam and Group 2A Cut off Marks, immediately start your preparation for TNPSC Group 4 Exam 2014. Since exam is scheduled to be conducted on 21-12-2014, you have very short period of time for the preparation. 10-10-2014 : Though there is no official information about the TNPSC Group 2A ( 29-06-2014 ) Exam result date, we can expect the results in this October or November 2014. TNPSC Group 2 Preliminary Exam December 2013 Results Published on 08-09-2014 in TNPSC's official website www.tnpsc.gov.in . If you have cleared the Group 2 Preliminary Exam 2013, don't worry about Group 2A result , concentrate on Group 2 Mains Exam Preparation. Next most expected results from TNPSC may be TNPSC VAO Exam 2014 and TNPSC Group 2 A Exam 2014 . You can start your preparation for the upcoming TNPSC Group 4 Exam 2014 also. 26-08-2014 : TNPSC has informed that the TNPSC Group 2 Interview Posts Exam December 2013 Results will be published with in two weeks and the TNPSC VAO Exam 2014 results will be published with in two months. TNPSC conducted TNPSC Group 2A (Non Interview Post Exam) was conducted on 29-06-2014 to fill posts in various departments. The exam was attended by 4,23,890 candidates. There were 2,80782 applicants didn't write the exam. Most of the candidates who wrote TNPSC Group 2A Exam on 29-06-2014 said that the General Tamil portions were easy and General Knowledge portions were tough. So the cut off marks may be slightly lower this year . When TNPSC Group 2 A Exam Result of June (29-06-2014) Exam ? The TNPSC Chairman (Add. Charge ) Mr.Balasubramanian has informed that the Official Answer Keys will be published in the TNPSC website with in two weeks and the results will be published soon. But TNPSC Annual Planner Says that the results of TNPSC Group 2A Exam will be published in the 3rd week of August, 2014 . It was the date given for the previous exam date of 18-05-2014 . Since the exam date was conducted after one month of previous exam date , we can expect the results in September or October 2014 .